This dish was deeply satisfying. A hit with the entire family! It was so simple and easy to make! Cook Arborio rice in chicken or vegetable or stock. Cook spinach until tender and wilted. Chop coarsely. Cook onion and garlic in some butter. 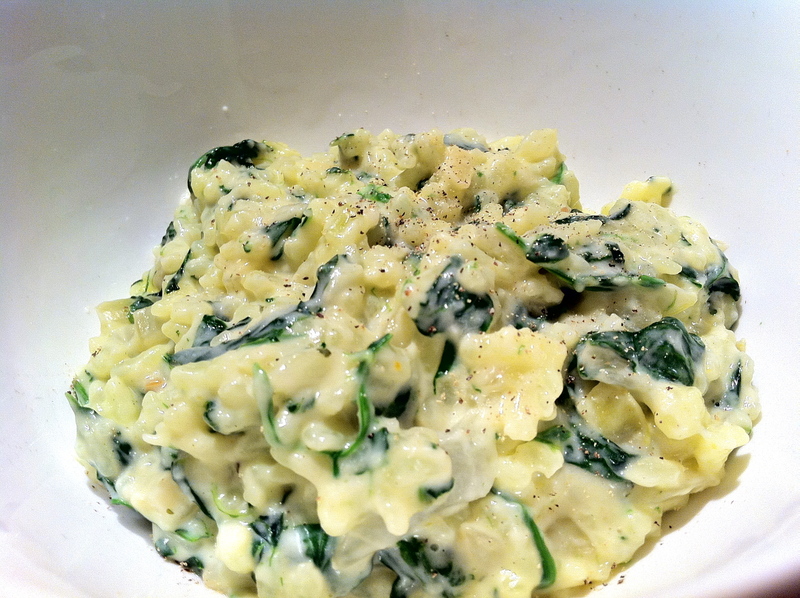 Add rice, spinach, cheese, cream and season! I can’t wait to see the creative interpretations of this week’s French Fridays with Dorie recipe by the group members! Tags: comfort food, cooking, food, french fridays with dorie, recipes, rice, risotto | Permalink. Sanya – love the new look on your blog. This rice was indulgent & satisfying – I agree. Its going to be fun checking out eveyone’s rice photos today! We enjoyed the flavors of this dish as well. This looks like it could be a meal all by itself. I can’t wait to try it. Your photos are gorgeous! I love to see everyone’s take on the dishes – makes Friday’s so much fun! 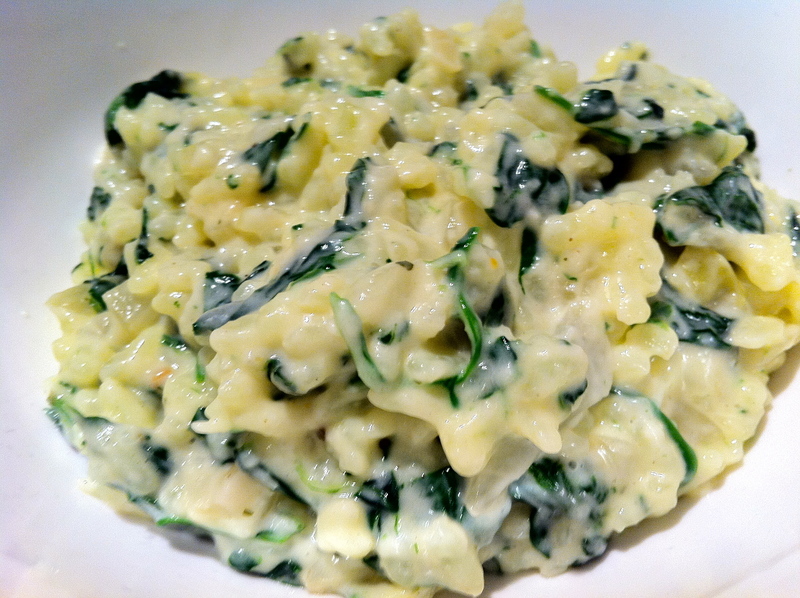 This was a big hit in our house too, I think it’s a lot to do with the creaminess and cheesiness of the sauce and not so much the spinach :-). Indulgent definitely seems to sum it up. We really enjoyed this one too, though not sure we will be making it too often. I was pleasantly surprised by this dish. Great photos! Nice pictures. They make the dish look so creamy that I’m surprised I ate as much as I did. Your photos show a really creamy rice. I added more cream, but now I wish I had added even more. Nice post. I agree with you. Simply delicious and easy to make too 🙂 Yours look mouthwatering ! I loved it too your pic made me hungry! We loved this one too. I was surprised how easy it was. It was delicious too, though that wasn’t a surprise. Your photos are beautiful, Sanya. I agree – I just added it to my comfort foods list! Oh I love how you’ve revised your blog! So beautiful! And I’m so happy you’re back with French Fridays! Beautiful pics! And a lovely recipe, truly. Oh my, your rice looks amazing! Oh, your new blog look is fabulous!!! Love it. And I love this rice, too…yummy! Your rice looks great! I loved how simple and delicious this recipe was. Definitely not risotto; but worth making in its own right. Nice blog re-design! Your photos look great, too. It’s nice to have another delicious and quick recipe in my back pocket, now. Love your new look! This was a wonderful dish and we all enjoyed it! Great photos!